The computer keyboard as we all know is an external input device necessary for the operation of different functions associated with the operating system installed in it. Windows and Mac are the two popular operating system, and both have specific keyboard parts and designs stipulated by Microsoft and Apple respectively. In this article, we will show you a common computer keyboard, its parts and operation of various keys. As mentioned earlier Windows operating system requires the certain keyboard layout for its operation. The above given is a standard wired keyboard manufactured by Microsoft itself. Lots of companies, including Microsoft has designed many other keyboards based on the prerequisites of the users. There are wireless keyboards that work with Bluetooth, and IR technologies. There are some other keyboards with extra functions for specific tasks; internet browsing, multimedia and gaming. In a multimedia keyboard, you would find a few additional keys; volume up down, a key for launching internet browser, play/pause/forward buttons, mail, shutdown/sleep, etc. Whatever be the keyboard design, the functions of the common keys remain the same, and its usage is globally accepted in English-speaking countries. 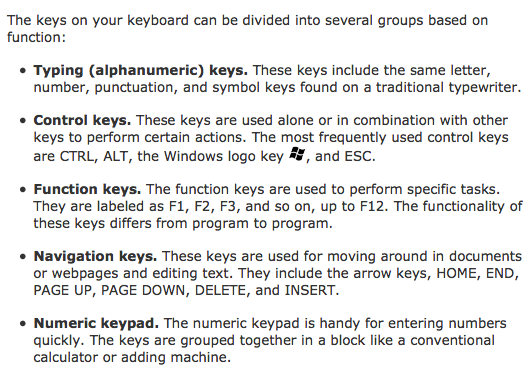 For more tips on Windows keyboard functions, usage, shortcuts and tips, visit the official Microsoft page here.